True Poker is one of the leading sites on the Winning Poker Network (WPN), so it’s a fine destination for all the poker games you enjoy whether they be cash tables, sit and go’s, multi-table tournaments or any combination thereof - all with 27% flat rakeback and a $1,000 deposit bonus! Intelligent poker players understand the major positive impact that rakeback can have on their bottom lines, so you’ll be pleased to discover that this profit-enhancing feature is fully supported at the site. When you sign up for our special True Poker rakeback deal, you’ll get 27% of the rake you pay returned back to you. There’s no minimum volume required, and this arrangement never expires: 27% rakeback will be credited back to your balance for the entire lifetime of your account! If you’re one of the few players for whom the poker room’s VIP program represents a better value, don’t worry. We can also hook you up with the standard VIP package, which is called Elite Benefits, instead. Along with your rakeback, you’ll also be able to receive a 100% up to $1,000 bonus when you make your first deposit. This is just the beginning of the rewards available because there’s an active and ever-changing lineup of promotions to satisfy new and returning players alike. When you consider its speedy cashouts, significant player volume and longstanding reputation in the online poker industry, you’ll see why this poker site is a solid place to open up your account and take a seat at the tables. For the purposes of calculating the amount of rake you’re responsible for in a given ring game hand, the weighted contributed methodology is employed. This means that you’re only considered to have paid rake if you actually made a contribution to the pot, and the amount you’re credited with is proportional to the sum of money you put in the middle as a fraction of the total size of the pot. Weighted Contributed rakeback is therefore more beneficial if you’re a loose, action player rather than a tight nit. The calculations for SNGs and MTTs are simpler and just involve multiplying the house fee by 27%. You can request your rakeback payments conveniently through the poker client whenever you want. This separates True Poker from some of its competitors that only offer rakeback at scheduled intervals. Upon funding your account for the first time, you’ll be issued with a pending bonus for 100% of the size of your deposit up to a maximum value of $1,000. Then for the next 60 days, you’ll earn $1 of this bonus whenever you accumulate 27.5 Award Points. Collect Award Points simply by playing whatever formats and stakes of poker you wish to – you’ll get 5.5 points for every dollar you rake or hand over in tournament fees. You needn’t enter any True Poker bonus code when setting up your account or making your initial deposit: The bonus will activate automatically upon the successful conclusion of your qualifying transaction. Much as with your rakeback, you’ll have the power to more or less issue your own bonus payouts whenever you feel it’s appropriate as long as you’ve gathered the required number of Award Points. The first deposit bonus thus has value even if you can’t clear it all due to the fact that you can claim whatever portion of it you are able to earn within the 60-day timeframe. From the rates of point accrual and bonus issuance described above, it’s a trivial matter to determine that the signup bonus is the equivalent of 20% rakeback. You might suppose then that it’s better to forgo the bonus and just opt for 27% rakeback instead, but you’d be mistaken. The rakeback and bonus will act in concert to boost your profitability more than either perk would do on its own. Any bonus payments you collect will indeed be deducted from your rakeback, but you’ll still be better off with both promos active than you would otherwise be. Let’s look at an example. You create your new account by following our special link, and then you make a deposit of $1,000 to get a matching $1,000 bonus. Over the next two months, you amass 2,750 Award Points while raking $500. Because the bonus needs 27.5 points per dollar, you’ll be entitled to $100 from your bonus. This $100 is subtracted from your $500 rake total, and your rakeback percentage is applied to the remainder ($400). $400 * 27% = $108, and this is the amount of rakeback you’ll get. Adding these two numbers together, we find that you’ll receive $208, or 41.6% of the rake you paid. 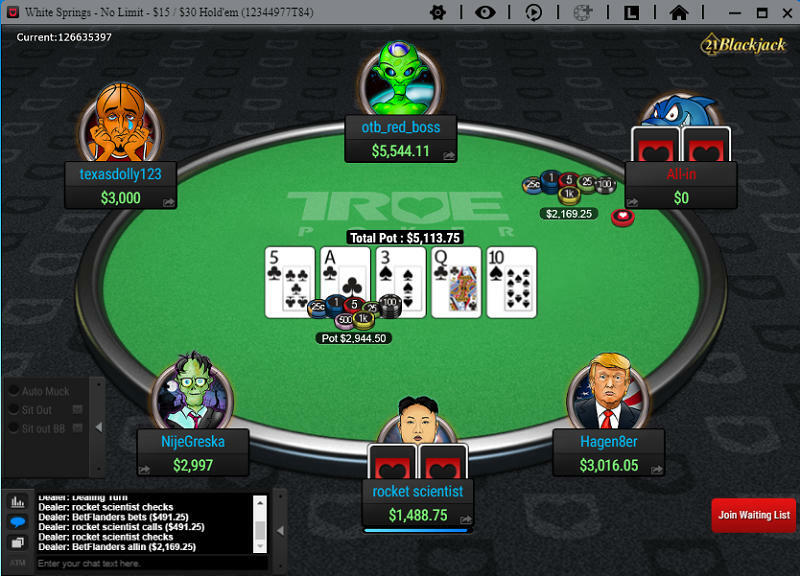 Watch our video above to learn how to open your new True Poker account, or keep reading below for text instructions. Step 1: Clear your cookies - this is mandatory for proper tracking! Click the links below for instructions. Step 2: If you've previously installed the software, you must uninstall it now before continuing. Step 3: Select the account type you would prefer by clicking the appropriate link or banner below. Step 4: Download and install the poker client. Step 6: Create your tablename (this is displayed on the tables). Step 7: (Optional) If you would like us to confirm your rakeback is properly set up, please Skype or Email us your login name and registered email address. If you have any questions, please try the FAQ. After you first make a deposit to your account, you’ll be granted access to weekly $250 Depositor freerolls for the rest of the calendar month. They’re held on Saturdays at 12:05 p.m. EST. Time your deposit near the beginning of the month so that you gain access to the maximum four entries that you can receive. A small portion of the rake in ring games is siphoned off toward The Beast, a leaderboard that rewards the highest-ranking players every week. Compete for satellite tournament entries and cash prizes merely by putting in the time at any cash game table apart from heads-up ones. SNG grinders will appreciate Sit & Crush, which pays out cash and satellite seats to the top point earners every week. Collect points by playing in sit n’ gos, Jackpot Poker, freezeout MTTs and On Demand tournaments to climb the ranks. The payouts you receive from Sit & Crush don’t come with any playthrough requirements, so they’re pure profit from your point of view. From time to time, those who wish to make further deposits after their first will be able to get reload bonuses on their re-deposits. Be alert to these offers, which aren’t available all the time, so that you don’t miss out on any free money. You might need to enter a True Poker bonus code in order to claim a reload bonus, and the percentage match and maximum bonus value will vary with each reload. If you’re in the United States, you can add money to your balance via Visa, MasterCard or one of several money transfer services. Unfortunately, you can only deposit up to $550 with a credit card and a slightly higher amount using a money transfer company. If you’re located elsewhere in the world, then you might have additional options open to you, such as the ewallets Neteller and Skrill. Regardless of where you reside, you can deposit painlessly with the cryptocurrency Bitcoin. The maximum transaction value with BTC is $25,000, which should suffice for almost everyone. On the withdrawals side of the fence, Bitcoin is also a convenient choice. This is because payouts through Bitcoin are processed within 48 hours, and there are never any fees. Checks, on the other hand, carry a fee of $65 except for one free check per month. Debit cards and money transfers are also possible ways to receive your winnings, but every single cashout involving these methods incurs additional charges. True Poker now has the ability to process alternate digital coins besides Bitcoin. Ethereum, Litecoin, Bitcoin Cash, and Dogecoin are just a few of the more than 60 possibilities. You can use them both to fund your account and to receive payouts. In most cases, the transaction limits are a bit lower than they are with BTC, but you'll still be able to move thousands of dollars' worth around without incident. Whether you’re a micro-stakes novice or a seasoned high-stakes pro, you’ll find the poker games you want to join – or at least, you will if you play No Limit Texas Hold’em. Games run from $.01/$.02 all the way up to $50/$100 in both NLHE and its four-card brother, Pot Limit Omaha. You’ll probably see at least a table or two running at the top of this range during peak hours with more than a dozen games active at each of the lowest levels. Limit Hold’em is offered at stakes through $30/$60, but only a handful of tables fill at a time. Fixed Limit Omaha/8 is present too at blind levels up to $75/$100, but traffic is a bit light. Seven Card Stud rounds out the lineup, with Hi spread up to $30/$60 and Hi-Lo offered up to $40/$80, but there are typically fewer than 10 tables going in total. In September 2018, the Winning Poker Network debuted 6+ Hold'em. Played with decks from which all cards lower than 6 have been removed, this variant promises more highly contested pots than normal Texas Hold'em because starting hand strengths tend to be less divergent. The only real rules changes from normal Hold'em are that flushes beat full houses and sets are more powerful than straights. You can play 6+ Holdem at blinds ranging from $0.01/$0.02 up to $50/$100. The avatars at True Poker are a bit cooler than similar graphics at most competing sites. On top of just being able to select an image to display next to your name, you can also choose from five poses for each avatar. Some of these avatars seem based on generic characters, but a few of them appear to be inspired by famous real-life and pop cultural figures. Bankroll-strapped players will appreciate the On Demand tourneys, which aren’t spread at every internet poker site. There are both freeroll and micro-stakes On Demand events that start when a certain number of people have registered, like a normal SNG, but they have a late registration period during which more people can enter, similar to an MTT. Apart from these special tournaments, SNGs are held at price points from $1.50 + $0.11 up to $1,200 + $15. The games that run most frequently are Texas Hold’em contests at around the $60 level and below. Jackpot Poker is a type of lottery Sit & Go present at True Poker and other Winning Poker Network skins. Whenever three players sign up, the Jackpot Poker SNG will begin, and a multiplier will be selected randomly from certain preset values between 2 and 2,500. The prize pool is equal to this number times the buyin amount. Jackpot Poker is pretty popular with recreational players because it combines the skill of poker with the luck of a lottery ticket. You can buy into NLHE Jackpot Poker for $2, $10, $25 or $40, and PLO Jackpot Poker is offered at the $2, $10 and $25 levels. The regular MTT schedule includes tournaments as inexpensive at the $0.10 + $0.01 daily $100 Guaranteed and as pricey as the $500 + $30 $20,000 Gtd High Roller Event, which runs on Wednesdays. The signature weekly event is the Sunday Special, a $200 + $15 tourney that guarantees a prize pool of at least $150,000 and takes place every Sunday at 3:00 p.m. EST. The Winning Poker Network has made a name for itself by debuting non-standard tournament offerings. They include The Cage, a $1,000 + $50 event that’s a combination of tournament and cash game. The gameplay is on a strict timer, and the action concludes after five hours. At end of The Cage, the remaining chips are converted to dollars, and every player keeps what they have remaining in front of them. Watch out also for Million Dollar Sundays, which take place several times a year and provide an opportunity to play for $1 million in prizes: a sum that can’t be matched by any other poker network open to U.S. residents today. The most noteworthy tournament series to grace True Poker is probably the Online Super Series (OSS). This recurring series features events with a diverse range of buyins, poker formats, table sizes and tournament structures. There are sometimes leaderboards to reward those who consistently perform well across multiple OSS events. Before closing out this review, we’d be irresponsible if we failed to inform you of an alternative setup that you may wish to choose instead of rakeback. Under the Elite Benefits program, you can earn points with every hand or tournament you participate in and then trade these points in for cash and other goodies. The details of this plan are quite complex, but we’ve outlined them all in our comprehensive comparison of the Elite Benefits scheme against straight rakeback. Under Elite Benefits, certain players may achieve an effective cashback percentage well in excess of the standard 27% rakeback offer. If you play a large total volume of hands or sit at high-stakes tables regularly, then Elite Benefits may be right for you. If you’re an infrequent or low-stakes player, then you’re probably best off with the rakeback deal instead. As part of our exhaustive investigations into the offerings of True Poker, we've browsed through the most prominent online forums to see what real-life users have to say. Below, we've included some of their comments so that you can take a look at them. As you can see, they're mainly positive albeit with a few disappointed customers weighing in too. While True Poker serves players from the United States and internationally, those located in France, Spain, Turkey, Guadeloupe, French Guyana, Mayotte, Reunion or Martinique are out of luck because new account registrations aren’t permitted from these areas. If you are a player from the United States, be sure to check out our US online poker guide for more information about poker sites that may be available for you. Does True Poker offer flat rakeback? - True Poker indeed does offer the same 27% that's present at other WPN skins, and this flat rakeback is only available by signing up directly with certain affiliates, such as Professional Rakeback. What cash games count towards The Beast? - All cash games count towards The Beast with the exception of heads up tables, those are excluded. I see a fee is taken for The Beast and Sit and Crush, am I paying extra for these promotions? - No you are not! Those fees come out of the rake that was already collected. As such, the poker sites themselves, as well as their affiliates (like Professional Rakeback) pay for these promotions, NOT the players! These promotions are a freeroll! How often does True Poker offer reload bonuses? - Rather sporadically at this time - but stay tuned to ProfRB.com, as we will post them when they do occur. Players usually have 45 days to clear reload bonuses - but we will keep you informed here on the site of bonus-specific timeframes and playthrough requirements. When offered, the TP reload bonuses are often 100% match with a $200 cap and clear at the equivalent of 20% rakeback for Elite Benefits VIP players. I'm currently playing through my initial deposit bonus and see there is another reload bonus I want to take advantage of. Can I "stack" them? - Yes! First, make a deposit with the appropriate reload bonus code in your cashier. Once that is complete, simply click the "Rewards" tab in your poker client, and then click "Bonuses" (in the gray bar next to the "Rake Back" option). There, you'll be able to toggle between your active bonuses using the red arrow. Select the bonus you wish to play through, and away you go! Please keep in mind, though, that bonus clearing time limits still apply.